The field guide presents background information to show the Ethiopia mind-set through its history, language, and religion. It also contains practical sections on lifestyle, customs and habits. For those seeking more extensive information, MCIA produces a series of cultural intelligence studies on Ethiopia that explore the dynamics of Ethiopia culture at a deeper level. Ethiopia, approximately twice the size Texas, is the largest country in the Horn of Africa (HOA). It is landlocked and shares borders with Eritrea, Djibouti, Somalia, Kenya, and Sudan. The capital city is Addis Ababa. Most of the population lives in rural areas and only a small portion (16 percent) live in urban areas, despite rapid urbanization (4.2 percent annually). Ethiopia is one of the poorest countries in the world, and most Ethiopians endure many hardships including famine and inadequate health care. Ethiopia is home to at least 76.9 million people, surpassing Egypt as the second most populous country in Africa, behind Nigeria. It is also one of the most culturally diverse African countries, with more than 80 ethnic groups. Its government is based on a system of ethnic federalism that divides the country into administrative regions based on ethnicity. There are nine regional states and two city-states. As a result of these political divisions, ethnicity is an increasingly important part of Ethiopian identity in both the private and political spheres. Sixty percent of the population speaks the national language, Amharic. Members of the Amhara ethnic group (15‑20 percent of the population) speak it as a native language, while 40‑45 percent of the population speaks Amharic as a second language. More than 70 other languages are spoken throughout the country, including the Oromo language, which 40-45 percent of the population speaks as a native language. Historically, Ethiopia has been strongly associated with Christianity, particularly the Ethiopian Orthodox Church. In the late 1800s, Emperor Menelik II referred to Ethiopia as “a Christian island surrounded by a sea of pagans.” However, Ethiopia likely has at least as many Muslims as Christians, if not more. Many Ethiopians are proud that their country is one of the oldest in Africa and that Ethiopia was the only African country to remain independent from a European power during the Scramble for Africa in the 19th century. While many Ethiopians are proud of their history of independence from non-African rule, members of some ethnic groups believe they have been marginalized since the Ethiopian state was formed. These conflicting historical narratives influence the social, cultural, and political spheres of modern Ethiopia. Ethiopia has had a close and enduring political and strategic relationship with the United States for many years. The United States often supports Ethiopia’s government and the EPRDF party. However, since many Ethiopians fear and resent the EPRDF and view its policies as undemocratic, they are displeased by continued U.S. support. Some Ethiopians believe that the United States is the only country able to pressure Ethiopia’s government into changing its policies and see the U.S. refusal to do this as hypocritical. Suspected human rights abuses within Ethiopia in recent years have increased tensions between the two countries. 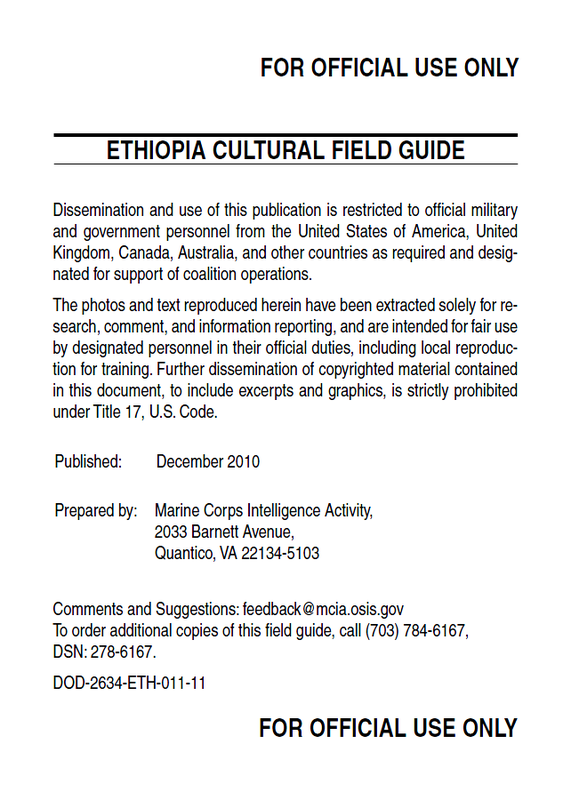 Nevertheless, Ethiopia remains a key ally with regard to U.S. counterterrorism policies in the HOA. In general, Ethiopians have a positive view of U.S. citizens and culture. Older Ethiopians fondly recall the presence of Peace Corps volunteers during the reign of Haile Selassie, while younger Ethiopians are proud to own the latest electronics and clothing from the United States. Ethiopia is a diverse and multi-ethnic society. It is home to at least 76.9 million people who are members of more than 80 ethnic groups and speak more than 70 languages. Groups living in Ethiopia developed separate cultural and language groups as early as 2000 B.C. However, even as they separated and grew more diverse, these ethnic groups continued to interact with each other through extensive trade networks, local and regional markets, inter-ethnic marriages, cattle raids, and warfare. The result is a population of distinct and historically autonomous ethnic groups that inhabit a common region and share similar cultural practices. The Amhara and the Tigray have long been the two most influential ethnic groups in Ethiopia. They have held political leadership roles since the time of the ancient empires and continue to hold power in the modern political system. Since 1991, ethnic identity has become increasingly politicized as interest groups mobilize based on their ethnic affiliations and politicians’ increasing reliance on ethnic ties for support. This interaction between ethnic and national identity is influenced by a history of imperial expansion, independence from colonial rule, and the politics of ethnic federalism. The overthrow of the Derg regime in 1991 put an end to the idea of an Ethiopian national identity based on Amhara cultural traditions. Prior to the fall of the Derg, the Amhara identity was imposed on Ethiopians by a strong central government and was equated with the Ethiopian national identity. Previously, individuals often had to abandon their own ethnic identity and adopt the Amhara language and religion to succeed politically or financially in the Ethiopian Empire. When the Amhara lost power, this cultural identity began to decline in popularity. A sense of Ethiopian nationalism and identity still exists but is no longer confined to Amhara traditions. Modern Ethiopian identity is more diverse and regional identities are now more accepted as part of the national identity. In fact, individuals can gain influence, both formally and informally, by asserting their local and ethnic identities.